So sound the confused and increasingly desperate cries of a group of young Mexican students. The recordings, captured on mobile phones, have been played over and over again. The listeners search for a clue, any clue, that might help shed light on the horrific events that took place on 26 September 2014. On that fateful night, scores of students were ambushed by local police in the town of Iguala, located 130kms from the rural teachers college they attend in Ayotzinapa, Guerrero. The students were travelling in a convoy of commandeered buses with the objective of attending a march in Mexico City, commemorating the 1968 army massacre of hundreds of students at Tlatelolco in the capital city. Journalist John Gibler describes a series of coordinated attacks in which Iguala municipal police and unidentified gunmen opened fire on the students, killing six people and injuring many more. At the site of one of the attacks, police officers blocked the passage of the buses. Students who alighted from the vehicles were assailed by police bullets. One student was shot in the head, immediately signalling that this would be different from past confrontations with police. Police apprehended 43 students, carting some away in the back of police trucks. The students, last seen alive in police custody, have not been heard from again. Some students managed to flee the scene and either hid in nearby homes or concealed themselves in bushes overnight. A day after the heinous attack, one student’s mutilated body was found in an open field. His gruesome injuries point to possible drug cartel involvement. By early October, authorities had uncovered the first in a series of clandestine graves dotted around the town of Iguala. Sadness turned to outrage when it was confirmed that 30 charred bodies recovered from the mass graves did not belong to the students, begging the question: Whose bodies were they? In November, Mexican attorney general Jesús Murillo Karam announced a breakthrough in the case. Three cartel members allegedly confessed to receiving the students from Iguala police. The trio claim responsibility for killing the students and burning their bodies at a rubbish dump, before disposing of their ashes in a nearby river. This official version of events has been met with widespread disbelief, both from families of the missing students and the wider Mexican public. Mexican periodical La Jornada reports that physicists from the National Autonomous University of Mexico and the Autonomous Metropolitan University also dispute the claim, stating it would “defy physics” for so many cadavers to have been burnt in the manner specified. Instead, they offer the alternative hypothesis that the 43 students were incinerated in a crematorium, most likely belonging to the military or a private business. They have asked for log books from local crematoria to be made public in the interests of transparency. One of the academics, Jorge Antonio Montemayor Aldrete, has received threats for making these public statements. In December 2014, journalists Anabel Hernández and Steve Fisher published an investigative report in Mexican periodical Proceso, stating that the attack on the Ayotzinapa students involved collaboration between federal and local police, with the complicity or outright participation of the military. A leaked government report reveals the students’ movements were monitored by federal and state police on the day of the attack, from the time they left their campus in Ayotzinapa. 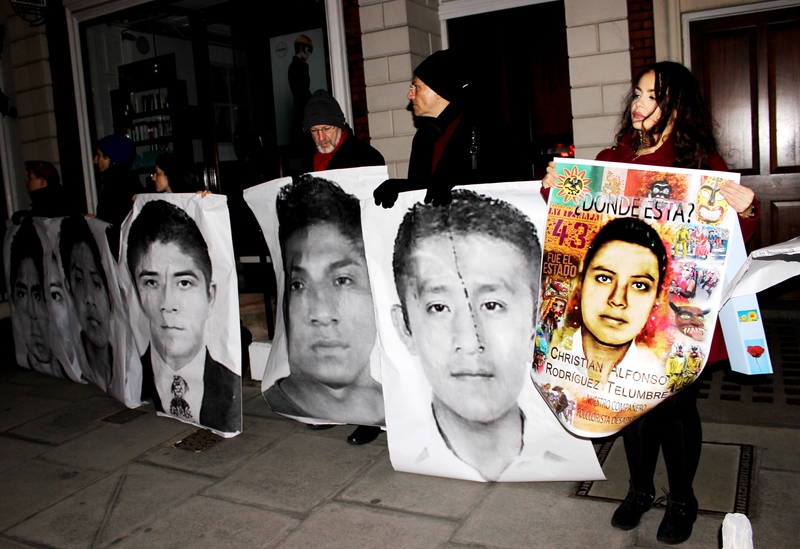 In Iguala, there are currently 375 documented cases of people forcibly disappeared at the hands of organised crime. The majority of these occurred between 2013 and 2014. 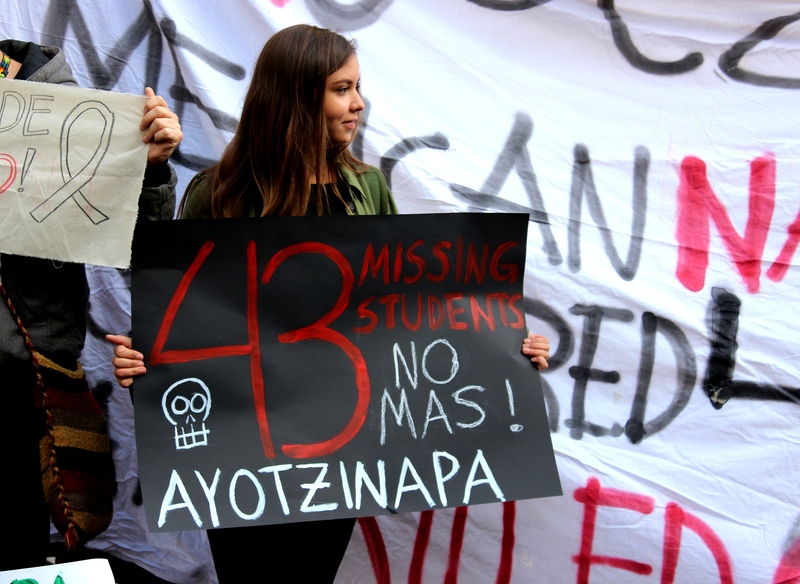 A poll conducted in November 2014 revealed that seven out of ten Mexicans believe the missing students of Ayotzinapa will not receive justice. 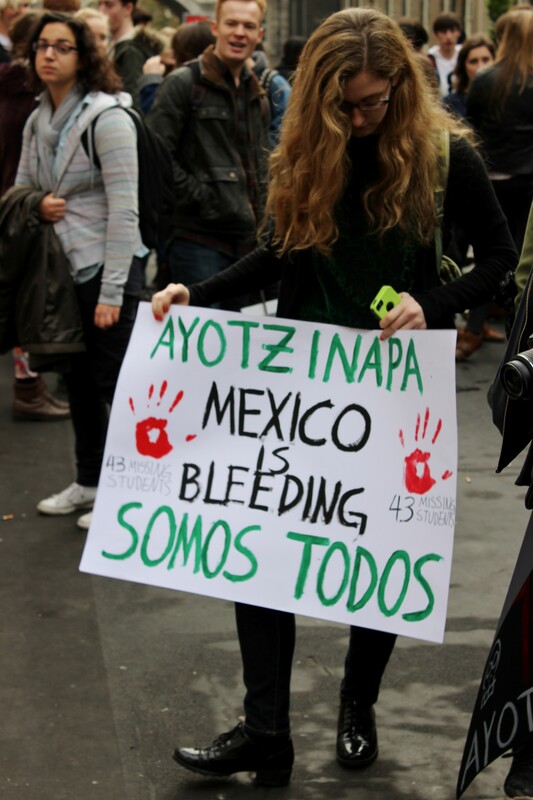 It is hard to convey the impact the case of the 43 missing students has had on the Mexican public. Protesters’ rage and fury was palpable as government buildings were set alight in Guerrero’s state capital Chilpancingo in November. Protests in Iguala also led to widespread damage to the municipal palace. Waves of protests continue to sweep the country. A convoy comprised of the missing students’ families and classmates has travelled around Guerrero and other parts of Mexico to spread word of the tragedy far and wide. They joined tens of thousands of people protesting in Mexico City on 20 November 2014, the anniversary of the Mexican Revolution. ’Fue el estado’ (it was the state) has become a rallying cry. On 6 December, the fate of one of the missing students was confirmed. An Austrian laboratory tasked with identifying human remains found in plastic bags in the San Juan River near Iguala announced a bone fragment belonged to Alexander Mora Venancio, a 19-year-old student from Ayotzinapa. A month later, the Austrian scientists reported that “excessive heat” had damaged the DNA in the remaining fragments, making the identification of further victims extremely difficult. 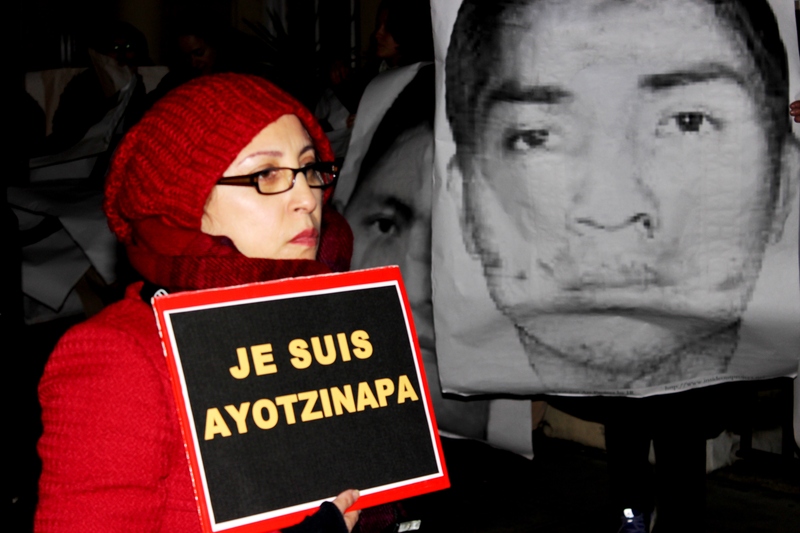 Ayotzinapa has produced a disproportionate number of leaders among Guerrero’s social movements, writes Francisco Alonso, a doctoral researcher at the European University Institute. “On one side the Iguala massacre is an archetypical case, in which a peaceful protest turns into a rebellion because of state repression,” Alonso explains. However, public officials and police colluding with a criminal gang is a fairly recent phenomenon. An earlier student massacre in 1960 saw 17 protesting students killed in Guerrero’s state capital Chilpancingo. In the 1960s and 1970s, a large wave of protest in Guerrero created a surge in armed guerrilla groups. Opponents of the state were brutally repressed during Mexico’s dirty war, in which many people were either killed or forcibly disappeared across the country. 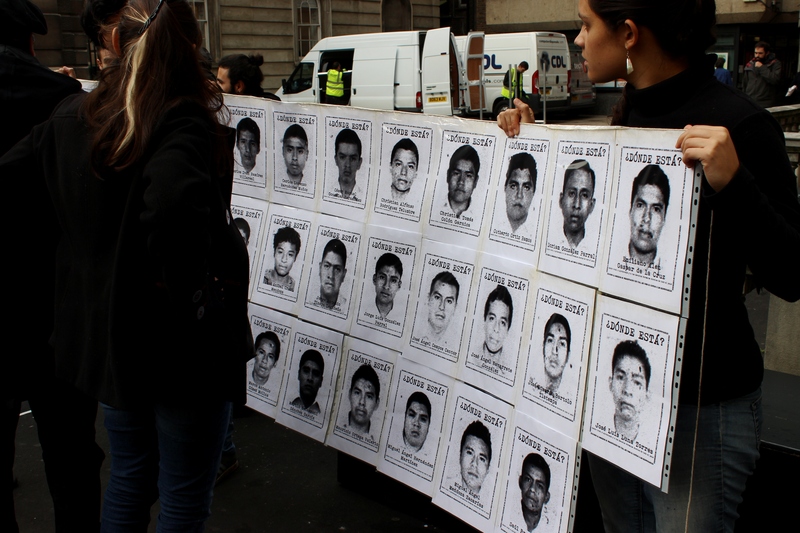 More recently, two Ayotzinapa students were killed by police during 2011 protests at the school. The deceased students are commemorated in murals at the college. State repression and involvement in human rights atrocities is by no means isolated to Guerrero. In June 2014, the Mexican army killed 22 unarmed people in Tlatlaya, in the state of Mexico, at least 19 of who were allegedly executed while kneeling on the ground. Initial claims that the victims were involved in organised crime are not borne out by forensic evidence or eye witness accounts. Human Rights Watch has called for greater transparency and accountability in the case. In a separate incident in January 2015, an entire police force was taken in for questioning over the case of a kidnapped journalist in the state of Veracruz. Much has been written about US support for Mexico in the form of the Mérida Initiative, a bilateral security cooperation agreement. The US government has provided Mexico with $2bn in military and police assistance and $4bn in weapons since 2006. The US not only provides training and intelligence, but there are also reports that Drug Enforcement Administration (DEA) agents and US Marshals have taken part in covert operations on Mexican soil. A 2013 study by the Igarapé Institute and University of San Diego found that almost half of US firearms dealers were reliant on demand from Mexico to stay in business, while less than 15 percent of illegally trafficked guns are seized at the US-Mexico border. It is notable that the vast majority (86%) of seizures occur on the Mexican side of the border. The authors categorise government efforts to stop the flow of weapons across the US-Mexico border as “largely ineffective”. Germany has also become embroiled in controversy over illegal firearm sales to Mexico. Some of the guns used by Iguala police against the Ayotzinapa students were German-made Heckler & Koch (H&K) weapons. H&K, Germany’s largest small arms manufacturer, illegally sold 9,500 G36 assault rifles to Mexico between 2006 and 2009. The German government approved the deal, stipulating the weapons could not be distributed to four Mexican states, including Guerrero, where police are deemed excessively corrupt and brutal. The Mexican defence ministry was unaware of this condition, however, and sent half of the shipment directly to the four embargoed states. “We have political principles that forbid delivering weapons to countries that disregard human rights,” says German anti-weapons activist Jürgen Grässlin, who uncovered details of the illegal export deal, “so we shouldn’t be exporting to Mexico at all.” EU countries exported more than €1bn of weapons and military hardware to Mexico between 2001 and 2012, the bulk of which came from Spain, France and Italy. Despite opposition from two left-wing parties, the German executive branch plans to implement a joint security agreement with Mexico that would foster closer ties and see police cooperation between the states. However, a Motion for a Resolution was lodged by the European Free Alliance Greens with the European Union (EU) Parliament in October 2014, calling for “all EU member states to suspend or withhold from any negotiation of security agreements between them and Mexico, among them Germany, and to declare Mexico a no go area for arms cooperation, as long as the rule of law is not re-established in the whole of the Mexican territory and organised crime is under control and dismantled”. The UK government continues to describe Mexico as a “crucial partner“. Indeed, the UK opened a new embassy, shared with Canada, in Monterrey, northern Mexico, in November 2014. The UK government is committed to a bilateral trade target of £4.2bn by the end of 2015 and plans to double the UK’s market share in Mexico to 1.5% by 2020. Armando Chaguaceda and Alex Caldera, political scientists from the University of Guanajuato, explain the current political context in Mexico was spawned by “three decades of neoliberal policies and the withdrawal of the state from its social responsibilities”. In order for organised crime to take root, they continue, “it required a weak and terrorised society, so that in areas where traditions of social organisation and mobilisation existed—including the student movement and community police of Guerrero—its mission has been to weaken social organisation and spread the message among the citizenry of the high costs of disobeying political/criminal power”.